Star trails and a Geminids meteor over Georgia in 1985. The last big meteor shower of the year — the annual Geminids shower — peaks tomorrow (Dec. 13), but bright moonlight is threatening to wash out what is usually one of the most spectacular light shows of the year. Lunar observers got a nice sight of the full moon and a total lunar eclipse on Dec. 10, but meteor shower enthusiasts will be disappointed to hear that this bright moon will likely spoil tomorrow night's show. Light from our planet's natural satellite is expected to illuminate the night sky, making it difficult to spot meteors as they streak through space. "The lunar eclipse is gorgeous, but it's not very helpful for meteor watching," Bill Cooke, head of the Meteoroid Environments Office at NASA's Marshall Space Flight Center in Huntsville, Ala., told SPACE.com. "This year, folks will get a nice double whammy with the lunar eclipse on the 10th, and then the Geminid peak on the night of the 13th, but it would be nice if we could just turn off the moon after the eclipse." The annual Geminid meteor shower has built up a reputation as one of the most impressive of the year, sometimes even eclipsing the more famous Perseid meteor shower that occurs every August. The Geminids are known for their slow and bright meteors, with some of them appearing yellowish in color, said astronomer Joe Rao, SPACE.com's skywatching columnist. On a clear night, skywatchers have reported seeing up to 120 meteors per hour during the peak of the Geminids in past years. This year, however, skywatchers can expect about half that rate, Cooke said. "There will probably be around 40 or 50 per hour on the night of the 13th," he said. "Unlike the Perseids, it will be really cold, so folks need to remember to dress warm. The Geminids are noted for bright meteors, and there can be a lot of them. The shower is probably the best meteor shower to watch when the moon isn't getting in the way. So, if you can brave the cold, the Geminids will not disappoint, in general." Occasionally, the Geminids can also produce stunning fireballs, and if that happens this year, they should be bright enough to be visible through all the moonlight. Meteors are often referred to as "shooting stars," but these streaks of light actually come from pieces of debris that hit Earth's atmosphere and burn up. Larger pieces that dive through the atmosphere can cause unusually bright meteors, which are called fireballs. Most meteor showers are the remnants of comets, but the Geminids are a little different. The source of these meteors is a strange asteroid called 3200 Phaethon, which sheds bits of dusty debris. A Geminid meteor streaks across the sky over Steamboat Springs, Colo., on Dec. 12, 2010. This space rock orbits closer to the sun than any other known asteroid, coming well inside Mercury's orbit. This behavior makes 3200 Phaethon more like a comet than an asteroid, astronomers have said, but it the object has never exhibited any other features that would classify it as a comet, such as a coma, gas jets or a tail. The Geminid meteor shower gets its name from the constellation Gemini, since the meteors appear to radiate from this point in the sky. When we look toward this spot, we are actually looking into the line of 3200 Phaethon's orbit, scientists have said. While this year's Geminid meteor shower may be more subdued, next year's light shows are already showing more promise. 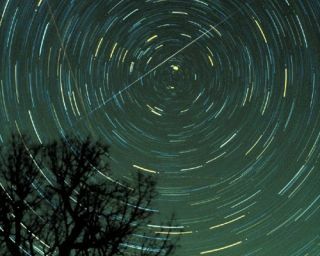 The Quadrantids will be the next major meteor shower; skywatchers can expect these to peak on the night of Jan. 3, 2012. The rest of the 2012 meteor shower lineup looks to be more impressive, with moonlight becoming less of a factor as the year progresses, Cooke said. "Next year will be a better year for meteor showers, as far as moonlight is concerned," he said. Editor's Note: If you do happen to catch a photo of the Geminids this year, and would like to share it for a possible story or gallery on SPACE.com, please email managing editor Tariq Malik at tmalik@space.com.